I had driven the prior evening and stayed in Cameron, Missouri and met up with Jonathan Williamson, Emilie Schroeder and their dog Bandit the following morning. I had been planning on targeting to the immediate east of the surface low as I was concerned that capping would be an issue further down the dryline. I also wasn’t a big fan of the southwest to northeast orientation of the dryline. The Storm Prediction center initially had our target area in an enhanced risk with a 10% hatched tornado probability covering a pretty large swath from North Central Oklahoma across Central Missouri. This ended up being upgraded at the 1630z update with a 15% hatched tornado probability for the triple point and along the warm front into Missouri. We left Cameron shortly before 15z and began the trek down I-35 to Wichita stopping north of Wellington and then to Blackwell, Oklahoma to sit and wait. Eventually cells began to go up on the triple point and that lured us from our position westward along highway 11. As we were approaching Medford the cell to our west became severe warned at 2130z. We began to focus on the lead storm in the complex as they all moved off to the northeast. Nothing about their presentation on radar looked too appealing, but sometimes you will get a dominant storm to suddenly take shape and organize out of the mess. Eventually the western most of the three main cells did just that and we started to head east on US 160 towards Medicine Lodge. On our way the tornado warning was issued which was later updated as verified by a tornado viewed on a live storm chaser feed. 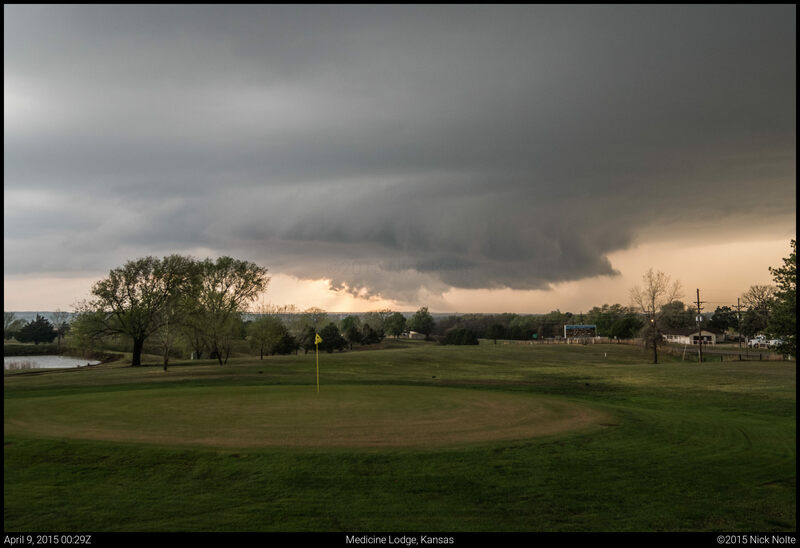 Eventually we caught a good visual on the storm and could see a very distinct edge to the wall cloud but hills blocked our view of the business end. With the road network almost non-existent in this portion of Kansas, we went looking for a better vantage point and eventually found one in a form of a scenic overlook along US 160 west of Medicine Lodge. 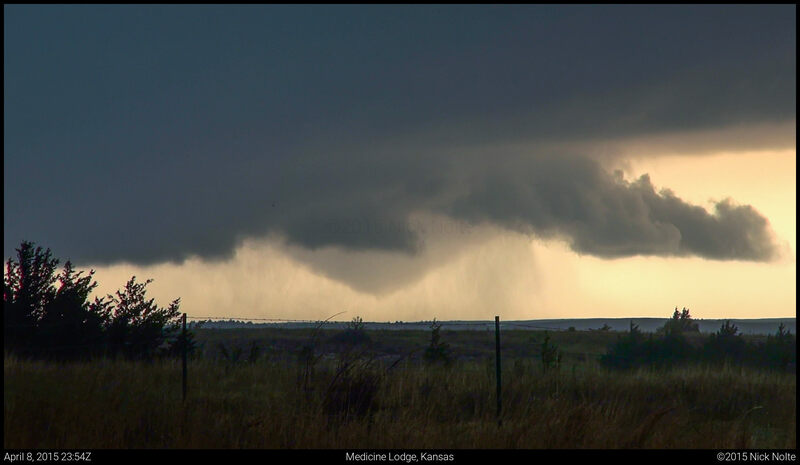 Here, we joined the throng of chasers who had already discovered this spot and got to view the cone tornado in progress. We stayed here until the forward flank of the storm encroached on our position and bailed east to stay in front of the storm. 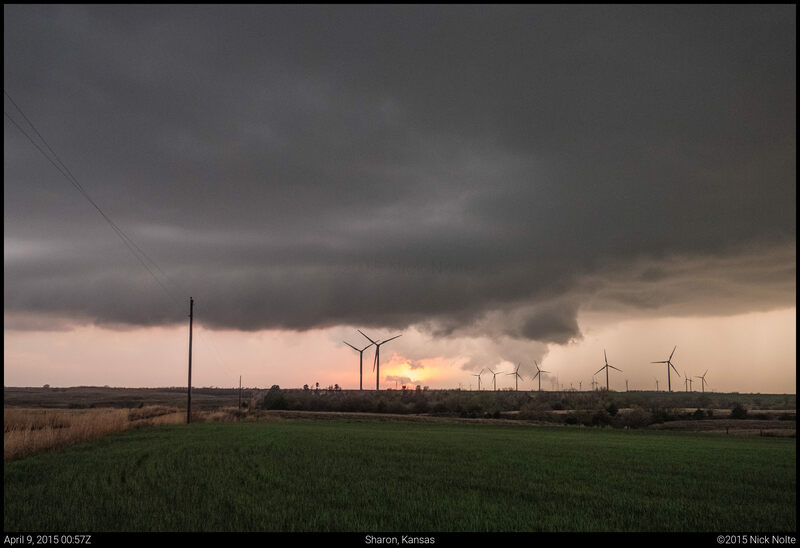 There were a few times where the wall cloud wrapped up and looked extremely solid and we though another tornado was imminent, but it never did produce after that last cone right at 0z. We kept up with the storm until sunset where we met up with Sean and the TIV on a dirt road to photograph the sunset behind the storm with a wind farm in the foreground. I would call it a successful chase for the first one of the year. The following day looked to be shaping up as an early start in Eastern Iowa and Illinois, so we had quite a drive ahead of us to get back in position to chase, and with that we began our drive back to Cameron, MO.